Saving money is easier with smartphones thanks to mobile applications that are dedicated to do the couponing work for you. These apps target consumers in a business-to-consumer (B2C) space, connecting people to local brands and businesses by sending coupon alerts. After all, who doesn’t love saving money? The Mobile Experience Company (MobileXCo) has partnered with the Toronto Parking Authority and introduced a pilot project in the Liberty Village parking lots. It’s the first mobile parking application that integrates coupons and parking in North America. The project allows members of the Green P Mobile Pay app to download discount coupons for retailers in the area. The pilot project is being conducted at two Liberty Village parking lots, one at 1155 King Street West and the other at 34 Hanna Avenue. The redemption process is fast and simple; all that’s needed is a smartphone. Once the customer uses the Green P app to pay for parking, discount alerts will be sent via text message accompanied with a download link for the coupon. Once the customer comes in-store to redeem it, they will be prompted for a code which will be given by the retailer. Click here to watch a demo of how this money-saving idea works. MobileXCo is a RIC Centre client that focuses on providing mobile marketing solutions in the Toronto area, assisting companies in establishing personalized relationships with customers through mobile messaging and web-based experiences. 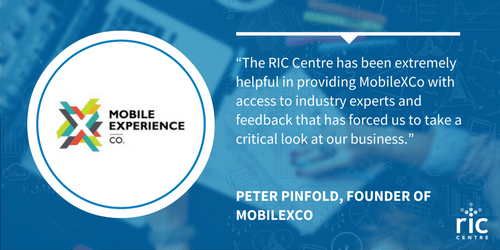 “The RIC Centre has been extremely helpful in providing MobileXCo with access to industry experts and feedback that has forced us to take a critical look at our business (from planning, sales and marketing strategy, to our product roadmap). Additionally, the RIC Centre has been a valuable resource in connecting us with potential partners to help expedite our growth,” explains Peter. Recently, they’ve partnered with a global messaging firm who’s looking to monetize their app to deliver one-time use mobile coupons to their users. The pilot is expected to launch later this year around September/October. To find out more about MobileXCo, check out their company website here.